In a move that will benefit the environment, farmers are placing increased emphasis on the quality of their soil and cutting back on ploughing. It took a kind of soil evangelist to create the revolution. Erica Goode has the story at the NY Times. “Mr. Brown, a balding North Dakota farmer who favors baseball caps and red-striped polo shirts, is not talking about disruptive technology start-ups, political causes, or the latest self-help fad. “He is talking about farming, specifically soil-conservation farming, a movement that promotes leaving fields untilled, ‘green manures’ and other soil-enhancing methods with an almost evangelistic fervor. “Such farming methods, which mimic the biology of virgin land, can revive degenerated earth, minimize erosion, encourage plant growth and increase farmers’ profits, their proponents say. And by using them, Mr. Brown told more than 250 farmers and ranchers who gathered at the hotel for the first Southern Soil Health Conference, he has produced crops that thrive on his 5,000-acre farm outside of Bismarck, N.D., even during droughts or flooding. “He no longer needs to use nitrogen fertilizer or fungicide, he said, and he produces yields that are above the county average with less labor and lower costs. ‘Nature can heal if we give her the chance,’ Mr. Brown said.” More here. Sounds like wisdom that even a backyard farmer could embrace. 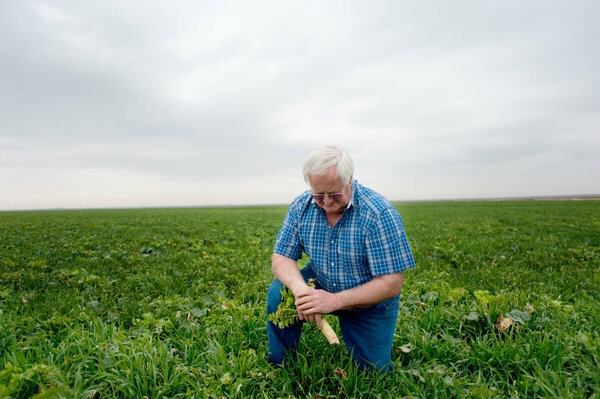 “My goal is to improve my soil so I can grow a better crop so I can make more money,” [says Texas farmer Terry] McAlister, who farms 6,000 acres of drought-stricken cropland.